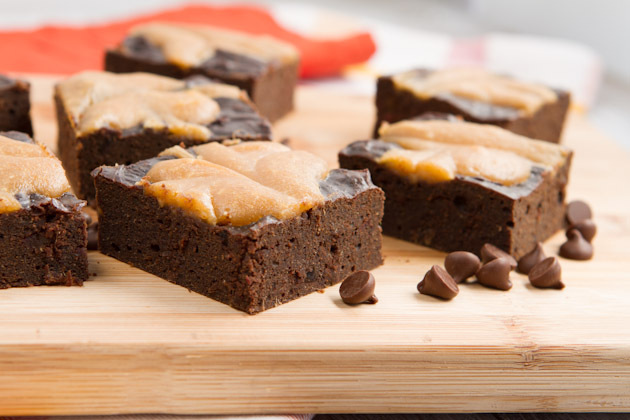 These are New Year’s resolution approved brownies. They’re oil-free, chocolate free (for those of you who have given up caffeine in 2013), flourless, under 15 grams of sugar and only 200 calories each. Make a batch and enjoy the fudgy goodness of a traditional brownie without all the added stuff. You’ll stick to your goals, indulge mindfully, and perhaps even learn that you can live a life of abundance without restriction and still be on the road to improving your health. And if you’re more of the school of thought that approaches each day of the year as an opportunity to change, know that treating yourself to these brownies is just one more step to achieving balance along the way. 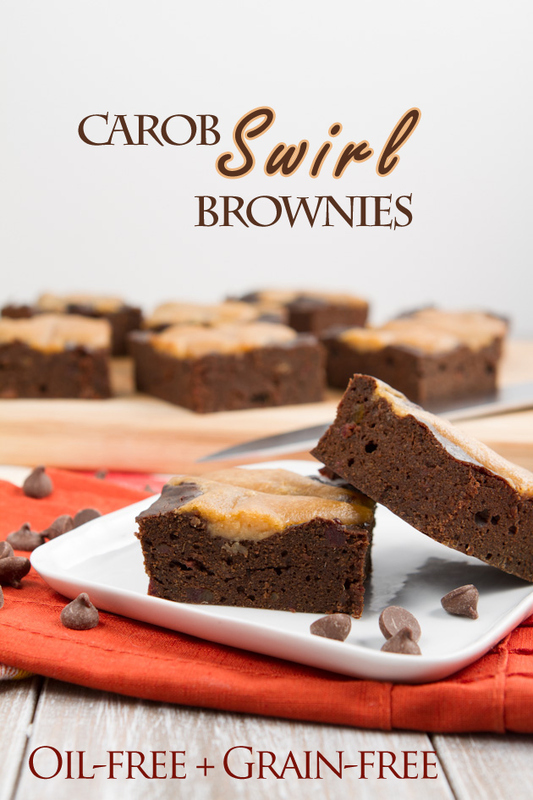 If you’re not allergic to dairy, you can made the swirl top of the brownies with Happy Days Goat Dairy for added nutrient awesomeness or prepare with my vegan cream cheese recipe for a batch of dairy-free brownies. I’ve tested both options and have included them in the recipe below. As you can see, the nutrient profiles of goat’s milk and cow’s milk are quite similar. Also, if you’re dairy-free, you’ll see that drinking a high protein non-dairy milk will still give you similar nutrients. What comes into play here are the four pillars that make up a healthy milk source. There are specific nutrients (not displayed in the nutrition tables) that bring goat’s milk ahead of the game compared to the other two. Another option, if you’re sensitive to soy and dairy in general is to add protein powder to your non-dairy milk, such as almond or rice, to boost it’s nutrient profile. Just add everything to a juice jug and have it on hand for recipes, cereal, you name it. And last thing to mention, too is the option to make this recipe nut-free. 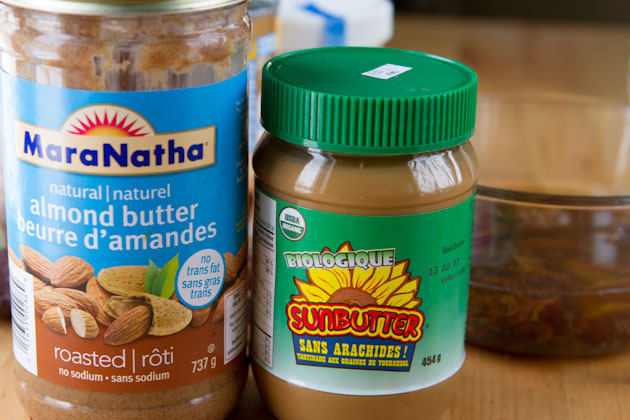 You could use any nut or seed butter you want, really. I made one batch with roasted almond butter and the other with organic sunbutter. Each were equally delicious, we couldn’t tell the difference between the two. Okay, let’s get to making these brownies, shall we? To view the dairy-free version of this recipe, click here. 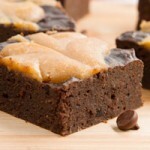 Flourless carob swirl brownies made with almond butter, coconut nectar and mashed dates. 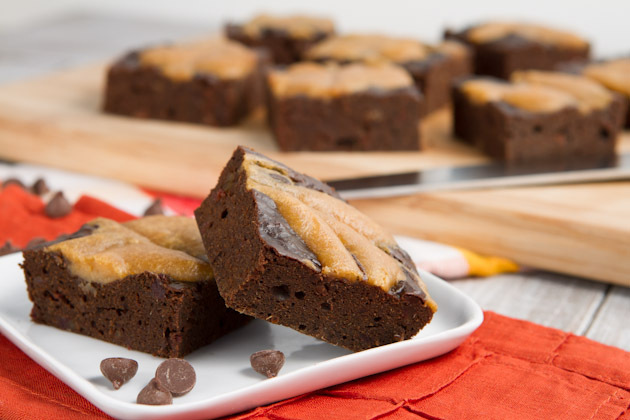 Much healthier than your everyday brownie but just as fudgy and delicious! Preheat oven to 350F and prepare an 8×8 baking dish by draping it with parchment paper on either ends. After dates have soaked for 30 minutes, drain and mash with a potato masher until smooth. 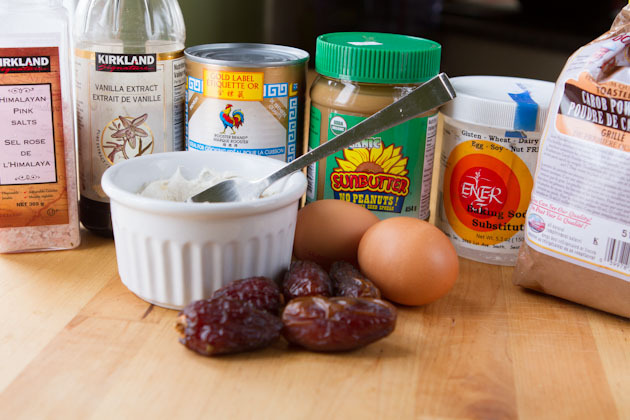 Combine almond butter, eggs, milk, date puree, nectar and extract in the bowl of your stand mixer or combine in a large-sized bowl with a hand mixer. Mix until smooth. Add carob powder, baking soda and sea salt. Mix until just combined. Drop mixture into prepared baking sheet and set aside. To prepare cream cheese swirl, add ingredients to a bowl and whip until smooth. Drop 9 dollops onto the top of the brownies. Then, starting in the corner, place knife in the middle of the far dollop and drag through the batter, end to end. Loop back to the next row of dollops and do it again. Repeat until marbled. Bake for 45-50 minutes, until a toothpick comes out clean. Remove from the oven and allow to sit for 5 minutes. Slide out of the pan, cut into 16 squares and enjoy! I did not test this recipe without eggs but if you're looking for an egg-free brownie recipe, I've posted something very similar to this recipe here. I suppose cocoa powder could be used in place of the toasted carob powder. We both loved the toasted carob for it’s richness. That, and carob doesn’t give me acne as chocolate has been doing lately! 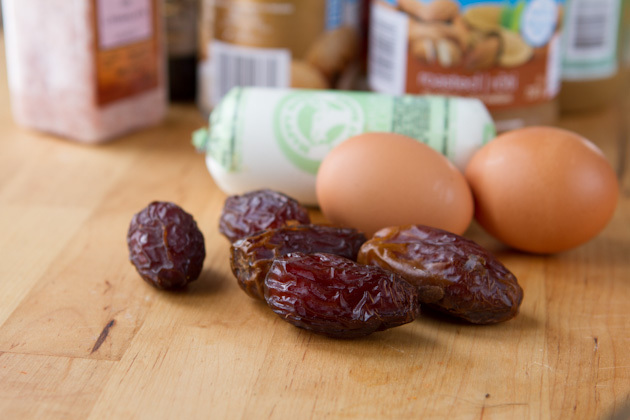 Begin by mashing the dates with a potato masher. If you don’t have one, try using a fork or food processor. You don’t need a stand mixer for this recipe, I just couldn’t help myself but come up with a recipe that required me to use mine (best Christmas present ever!). The batter will be just like traditional brownie batter. If eating raw eggs doesn’t give you the heebie jeebies, I highly encourage you to lick the beaters, spoon, bowl, whatever you can get your hands tongue on, really. Once the batter is all over your face in the pan, quickly prepare the cheese top and drop dollops onto the batter. All you have to do now is take a knife and connect the dollops like the picture on the right. I always imagined swirls on the tops of cakes being difficult, but it’s super easy! Bake and you’re good to go. Whether you enjoy this recipe with goat’s dairy or dairy-free, I just know you’re going to love them! What’s the milk of choice in your home? Compensation was provided by Happy Days Dairies. The opinions expressed herein are those of Healthful Pursuit and are not indicative of the opinions or positions of Happy Days Dairies.